That’s what I heard from the backseat of the car yesterday. At first I just smiled because she’s just so darn cute and then it hit me…. my 3 year old just counted backwards from 5!!!! I was so excited. I told her how great that was and how proud I am of her to count backwards and I said to her “Where did you learn to do that?” She said “at school mommy, the teacher told me”. How excited was I. Obviously school was a great idea. 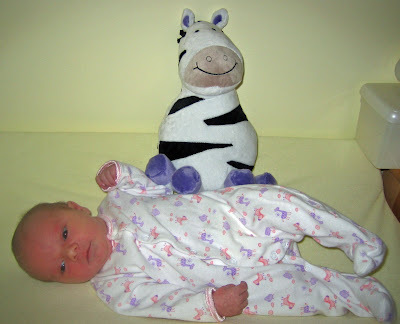 Here is her picture with the zebra the week she came home from the hospital. Looks like the baby got much bigger and the zebra got much smaller! She loves playing in the bathtub now that she can sit up and splash! This picture it looks like she’s saying “I don’t know why mommy wants me in this hooded towel”. A quick self portrait of Allison and Mommy. Karen, what a smart daughter you have! And I love the zebra photos. We do the same but with a frog. It is so great to watch them grow! wow Allison is getting so big, Holly too! Your girls are both so extremely cute!! Karen, Allison is growing so fast! You have such cute girls! We miss you on the message board! Wow – Allison has grown so much! She is a cutie just like her big sister. Addie is right, we do miss you!!! This is great! why didn’t you tell me what a big girl she is? 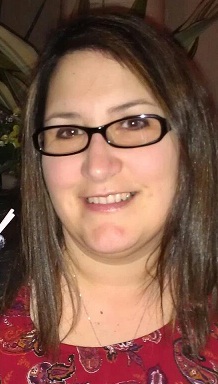 I did see how much she has grown and learned this week-end….and the conversations whith Holly were hysterical…. Karen, that picture of Allison with her hands up is sooo cute. Kids are too funny. That’s a great idea with the zebra. I may start to do something like that with this giant bear Brandon got. Next post: Standing A LOT!